Letters of resignation are usually complimentary in nature and include sentiments of thanks to the employee's soon-to-be former employer. These are formal letters and as such the content and presentation should reflect a formal, business-like tone. Letters of thanks and resignation should include three main components: the date that the resignation will be effective, the reason for the resignation and a message of thanks to the employer. The date that a resignation will be effective will depend upon the terms of an employee's contract but generally this date will be after a notice period of between two weeks and three months. If, however, a resignation is effective immediately then this should be explicitly stated. The reason for the resignation should of course be truthful, though if it is due to a difference of opinion then some euphemisms might be employed. Finally, most letters containing news of a resignation also contain a short message of thanks to the employer or organisation for the employee having had the opportunity to work with them. If there is no chance that a counter-offer will convince an employee to stay at a company or organisation then (s)he might include this information as well. However, the tone of letters of thanks and resignation should always remain professional and respectful as these letters usually become a part of an employee's file and may be the basis for a future reference, both for other employers and if an individual seeks to return to that employer at a later date. Letters of thanks and resignation should be delivered on paper rather than via email. This paper should not be from the individual's employer and certainly should not include the employer's letterhead. Instead, employees should prepare these letters away from the office and follow traditional business letter formats. 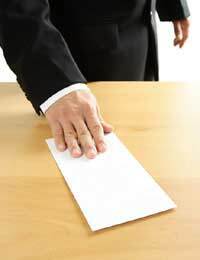 These letters may be put in the post or on the appropriate person's desk, but often letters of resignation are hand delivered during an appointment to discuss the matter. Multiple copies of these letters may be needed in order to notify all appropriate persons within a company or organisation. It is with regret that I must inform you of my impending resignation. Following my contractual notice period this resignation will be effective as of 20 December, 2008. I have greatly enjoyed my time with Any Organisation for the past five years. My colleagues here have been unfailingly supportive and professional, and I have learned a great deal about this industry and myself during my years here. Under your supervision both my knowledge and my skills have grown and I am confident that I would not be where I am today without having been a part of Any Organisation. However, I have decided to take some time to reevaluate my career goals and to consider further education in another field. If you would like to discuss my last four weeks, or if you require my assistance with recruiting and/or training my replacement, I would be happy to help out until 20 December. They do need to be formal letters, of course, and by saying how much you enjoyed working for the company (even if it’s a lie) you should be able to obtain a good reference. In many ways it’s a matter of form rather than anything deep, but that’s par for the course, and employers won’t expect more than that – simply that you’ve written the letter is more than enough.